241 out of 279 sessions attended (4 excused). 8409 out of 10060 votes during the mandate. 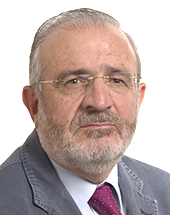 Positions of DÍAZ DE MERA GARCÍA CONSUEGRA in EP general rankings. Weighted estimate of activity calculated for DÍAZ DE MERA GARCÍA CONSUEGRA is 249.62 (+info). Mean productivity calculated for DÍAZ DE MERA GARCÍA CONSUEGRA is 1.10 (+info). Tables below show current number of activities registered by DÍAZ DE MERA GARCÍA CONSUEGRA. Values of Agustín DÍAZ DE MERA GARCÍA CONSUEGRA for each activity.